Sticking up out of nowhere in the flat Wisconsin landscape, the House on the Rock is a truly unique tourist attraction. Eccentric millionaire Alex Jordan Snr built the house, both in homage and retaliation to renowned architect Frank Lloyd Wright who dismissed his architectural aspirations. The Japanese-style house is rambling and dark, containing many collections of antiques and curiosities. It opened to visitors in 1959. From the late 1960s, the collections increased in eclectic directions, with additions built to house enormous displays of mechanical musical instruments, dolls, model ships, guns, and other items. Although not available to ride, the world's largest carousel is housed inside and a full-scale replica of a Victorian-era Milwaukee street. Another strange attraction is a full-size recreation of the squid and the sea monster from 20,000 Leagues Under the Sea. 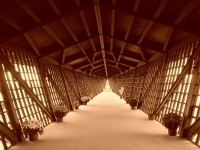 The House on the Rock's most famous feature is the Infinity Room, which juts out unsupported from the House 218 feet (66.5m) into the surrounding valley. The House on the Rock has continued to expand and now encompasses a resort area with hotels, conference facilities, a spa, golf course, and Japanese gardens, covering 200 acres in total. It remains one of Wisconsin's most unusual and unique attractions, with tens of thousands of people visiting annually.